Mind maps are ideal for closure activities because they ask students to logically process information they have learned and to relate that information in a visual display. Students are creating something unique with their mind maps and using higher level thinking skills to show relationships and process. Try getting students together in groups to graphically list what they have learned after a lesson. Teachers can also get groups to jigsaw different parts of a unit of study with mind maps and then bring their maps together to show the big picture. Mind maps bring the feel of visual note-taking but aren’t so reliant on art as a way to express ideas and lets students more clearly list supporting details. 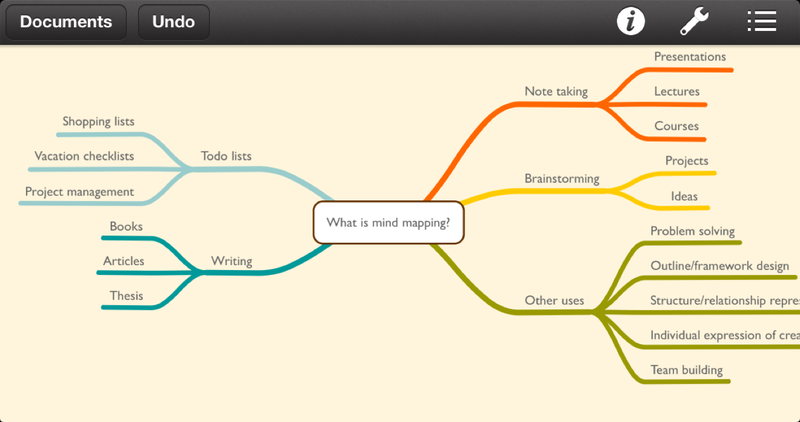 The simplest software I’ve seen for mind mapping is from mindnode.com. MindNode is an app for either your iPad or computer and the professional version is $20 in the Mac App store. I recommend downloading MindNode Lite from the app store for free first. This simple app is probably all that most people need to create mind maps and is easy to use. Maps from MindNode Lite can be saved as PDF files and printed out for future use–they make great study guides. The two mind maps included above were made using MindNode Lite. Let students create and explain what they have learned by using a mind map. I just wanted to let you know that another free one, and one that I started thinking about using is coggle.it. You can also use it to work with others and share the coggle, save it as a pdf or other files. I’m thinking about using it as a study guide/tool for benchmarks. If anyone would like to see what I’ve already started on I’d be more than happy to share and to collaborate.